The Pomegranate Outreach Event was more of a party than a typical outreach event. Heather Rouffe and her dynamic team at Atlas Party Rental were superb hosts and helped our Poms get in the creative spirit. After enjoying Mediterranean-inspired gourmet bites and pomegranate mojitos courtesy of a Mixologist from Salt7, it was time to design. 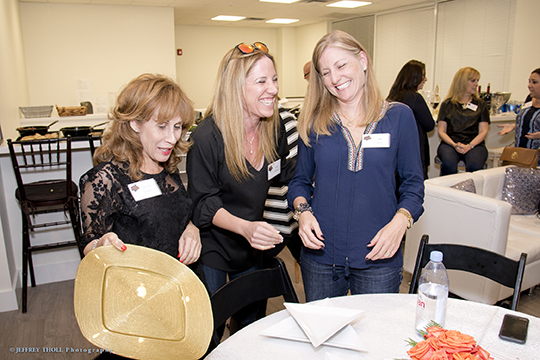 Chairs Joan Hauser and Nancy Gefen led the warm, fun and enthusiastic group of close to 50 women who embarked on creating dazzling tablescapes. From modern trends in floral centerpieces, to tablecloths, china, glassware, flatware, napkins and holder placement, the ladies learned about how to impress their guests for holidays or even casual get-togethers. It was such a great night, that in the end no one wanted to leave. The good news is that the next Pomegranate event should be just as exciting: A Night at Neiman-Marcus is scheduled for February 2 at 6:00 p.m. Stay tuned for details. For more information, please contact Janice Obuchowski at janiceob@bocafed.org or 561.852.3271. The Pomegranate program is for women who do a world of good by contributing between $1,800 and $4,999 to the Jewish Federation of South Palm Beach County Annual Campaign.